She Says: "I need a Keurig in my life. Everyone has one and raves about their coffee. I can do hot coffee, iced coffee, teas, I can do it all, and all for you." He Says: "Whats wrong with our current coffeemaker? And you don't even like tea." We have a current coffeemaker that works fine. It is very nice actually and even has a grinder built into it. But I have a case of the "I wants". and of course all of the Facebook Jewelry auctions. Blogging gets me every time. 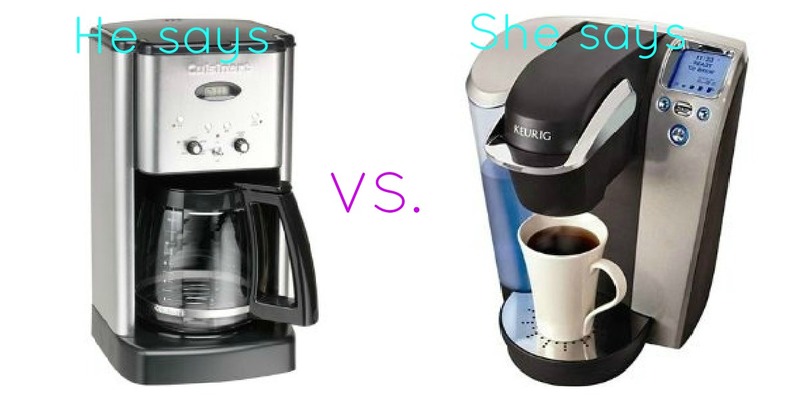 I would like to add the Keurig to my list of blogging must haves. But I like to keep my options open. What if I want a cup of "gourmet" coffee one morning? I can't have it unless I go to Starbucks and purchase an overpriced but heavenly cup of java. I could actually save money with the Keurig right? Those dang K-cups are pretty expensive though. And I don't need another expense in my life. So come on girls help me! Do I need this gorgeous piece of tech equipment in my kitchen? Give me some selling points to use on my hubs. Don't forget to enter the Little Green Pouch giveaway. girl you are spot on. i am SO guilty of this. i see a link to a shirt someone has on, i automatically have to love it, click on the link, before i know it i have bought it and then put it on the second i get it, take a picture, instagram it, rinse, recycle, repeat. ayi yi yi. lol. I have to laugh at the Keurig craze. 1. We don't do coffee in our house. 2. I worked for a vending company from 2002-2006. They had Keurigs way back 10 years ago in offices with the k cups. So, these aren't new, by any means. They have just finally hit store shelves and not just private coffee vending companies. Blogging does create a whole new world of 'want'. I like my big coffee pot simply because it allows me to dictate the amount I consume. Some days, one little package just isnt enough! Love the K cup maker! I use mine for coffee, obviously! But, also, I run hot water threw it to make tea too! Just found that out! I love mine! We have both, he has a coffee pot, I have my K cup maker! Love it! You need it for sure! P.S I think Kohls is having a sale! That's where I got mine!